It’s amazing how many people never look up. The skies can be many things to a photographer – a backdrop, a light source, a diffuser. Sometimes just a nice source of teal for your orange foreground. When you decide to use the skies for your subject, especially the night skies, the very first thing you are going to notice is the moon. There are some very beautiful objects in the night sky, and the thrill of using the camera to see what your eyes can’t see is enormously rewarding. The trouble is that the stars, planets and nebulae that fill the night sky are very dim and very, very far away. If, like me, you want to get great looking photos of the night sky, but can’t afford the gear required to capture some of the deep sky objects, you’re left with night landscapes, and the moon. So here’s some tips for shooting the moon. The moon is fairly close to the earth (in astronomical terms) – an average of 384,400km from us, it’s 3,476km in diameter and its surface is covered with regolith – a mixture of fine dust and smashed rock created by 4 billion years of meteor impacts. Regolith is surprisingly reflective. The moons albedo – the amount of light reflected back from the surface – is an average of 0.12. This means the moon is reflecting back about 12% of the light that is hitting it. This changes as the phase of the moon changes. This may be surprising, but you should think of shooting the moon in a similar way to shooting in fairly bright sunlight. This is because during the day on the moon it’s always in bright sunlight. On Earth we have a layer of atmosphere diffusing the sunlight. The moon has no atmosphere so 12% of the sunlight hitting the moon is reflected back. It’s always a bright summers day on the moon. This means that the settings you have painstakingly worked out for shooting constellations or star trails are going to leave you with a big, bright, featureless smear where the moon is. 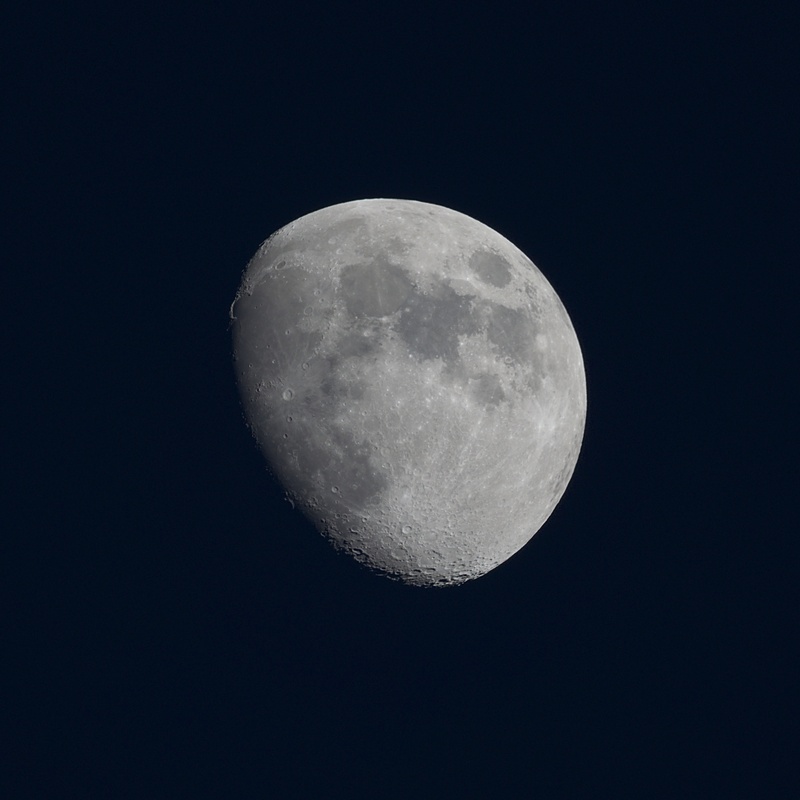 Conversely, the 1/200th at ISO 80 will get you some great moon shots. This means that you will have nothing but the moon in your shots. If you want to shoot a moonlit landscape that includes the moon, you will have to get clever with filters etc (graduated ND is always nice) and/or be good with an image editor or do double exposures. Last, but important, the phases of the moon, there are many websites and apps out there that can tell you what phase the moon will be, on what date, for the next thousand years or so. The moon has a 28-day cycle from new to new so you will never have to wait a long time for the awesome shot of the crescent moon you’re planning. Those very same websites will usually tell you the rise and set times for your location too. Remember, the moon is visible during daylight hours too. Having been trying to wring good night shots from second-hand, cheap and/or DIY gear for 2 years has taught me some things about preparation. 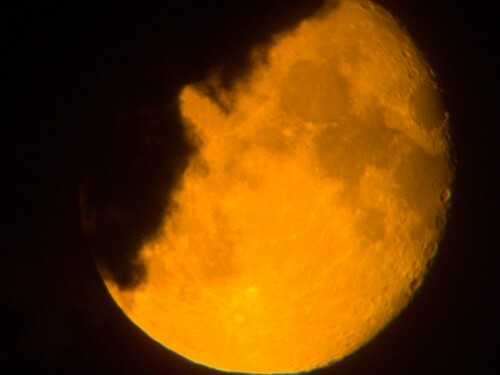 While it’s possible to get awesome shots of the moon on a whim by grabbing your camera and running outside when the clouds part, there are some things you can do to help the awesomeness along. Firstly, how warm is it outside? Temperature is a serious factor in getting good night shots. The warmer it is, the harder you’re going to have to work for your awesomeness. You know the heat-haze you get on hot roads? The sky is like that all the time and the hotter the place you are in, the more wobble you’re going to have to defeat. How warm was it before? This factor is also influenced by how hot the day was. See, the sun heats the earth – this is a good thing – as without it we’d all die. But when the part of the earth you happen to be standing on is not facing the sun (night time) that heat starts to trickle back into space. This causes distortion in the light coming in from the moon. The temperature of your CCD and lens has a big influence on your final shots, especially if you are using a compact camera with a small CCD. When you are planning to shoot at night, leave your camera gear outside for one to two hours before you use it – this will get the camera the same temperature as the surroundings and help get better shots. Compare those two photographs below taken with optimal and crappy warm factors. Secondly. Where is the moon? We live on a big ball, so we see through different amounts of our atmosphere when looking at the sky. The sky directly above you is the thinnest part of the sky, whereas the horizon is the thickest. So, when shooting the moon, try to shoot it when it’s straight up. It’s less wobbly. Light Noise. Where do you live? Near cities? All those orange sodium streetlights are going to have a big impact on your final shot. For the clearest shots, take a drive to the country if you can, get to the darkest place you know of, then shoot. Digital Noise. The nature of digital photography produces noise in the images. Minimize this by following temperature rules (colder the CCD, less noise) also, keep the ISO down when shooting the moon – bright summer day remember? 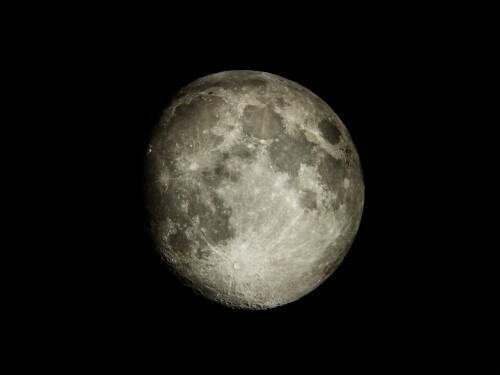 ISO 80, 100, 200 are plenty good for moon shots. 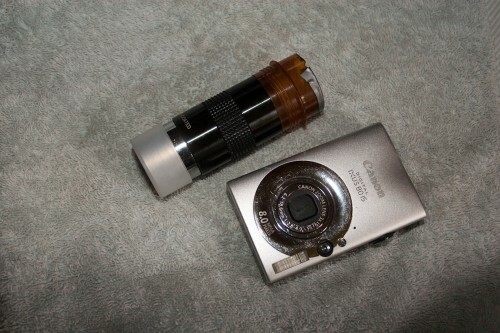 Also take dark frame shots (lens cap on or cover the lens and fire) throughout the night. 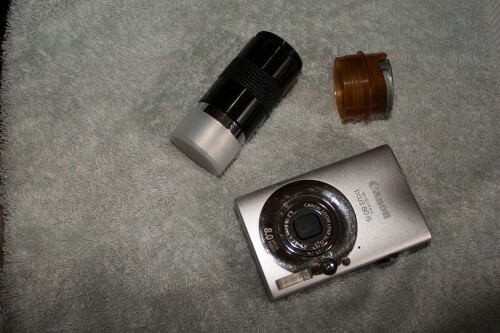 You can use these later to remove CCD noise from the final shot. If you take several “black frames” throughout your evening, you can get the noise levels the camera produces across a range of temperatures, then use them later to de-noise the images (see post section). Clean. Keep everything as clean as you can – lenses, telescope lenses, your mounts, your hands, everything. Mainly the lenses though. Isopropyl Alcohol helps to keep everything clean and dust free. Gear – Use What You Have And When You Want To Improve, Build More. I will not go into a long explanation of ISOs and Shutter speed and whatnot, I presume that you already have this information. Instead, I will talk about the 3 methods I kinds of moon shots I do. To get a good looking landscape including the moon, I use my dSLR (Canon 20D) or SLR (Canon 1000F) on a tripod with a nice wide angle lens. Those of you that use Canons will already be aware of their irritating tendency to not be able to focus on infinity in a sensible way. Focus is quite important, so take the time needed to getting the focus right. Be aware you are not going to get surface details in these shots, so settings would be for the landscape, not the moon. Twilight is the best time to get shots like this, where the sky still has some light in it and the moon is relatively dim enough to resolve detail. This shot is usually focused on the moon, and some of the clouds around it. 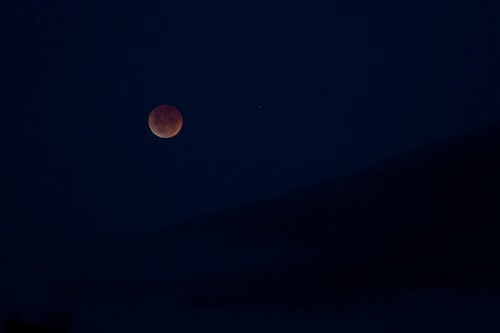 For a shot like this, I will again just set up an SLR on a tripod with a zoom or telephoto. Adjust focus and shutter speed, shoot with a remote as a telephoto lens is very sensitive to any wobbles. If I forget to bring my remote, I use the camera’s timer. I usually vary my exposure time and ISO when I am doing these shots as it gives me much more data to work with in post. This is where the DIY comes in. 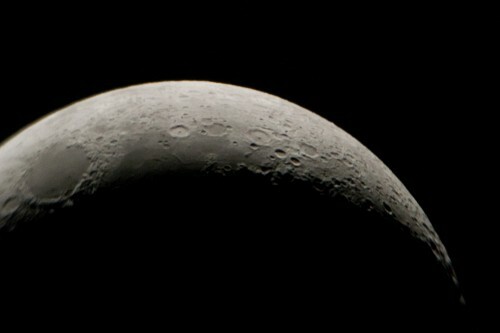 I have tried many techniques to shoot closeups of the moon. They all involve a telescope. There are two ways you can use a camera with a telescope, afocal photography and prime focus photography. Afocal photography is when the camera, with its lens attached, is mounted onto a telescope, also with its lens attached. You are thus capturing the image through 2 lenses and various mirrors. While this can lead to some wicked chromatic aberration, it is probably the easiest way of shooting through a telescope. Prime focus photography is when the camera, without a lens is positioned at the prime focus of the telescope, also without a lens. This will rid you of a lot of aberration, but also is a much fiddlier method of shooting. As of this date I have had very limited success with prime focus shooting. 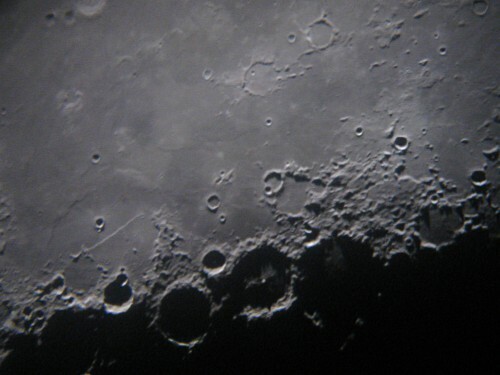 The moon is so bright and so easily accessible, that I have stuck primarily to afocal systems, using a couple of mounts I have made myself out of primarily, junk I had lying around the house. 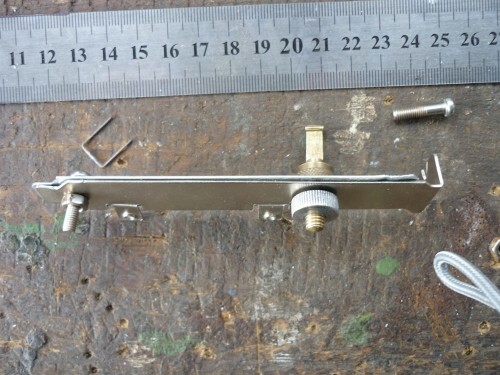 Ok, So How Do You Built An Afocal Device? First off, I have a 8 inch (203mm) Newtonian telescope. My best moon shots are all shot through this scope. If you have a crazy large telephoto lens, you can achieve better results than I can, because you may be able to shoot right through the telescope (prime), where I shoot afocally. A big lens is essentially turning the camera into a telescope, and you will remove all of the associated problems that afocal photography brings. 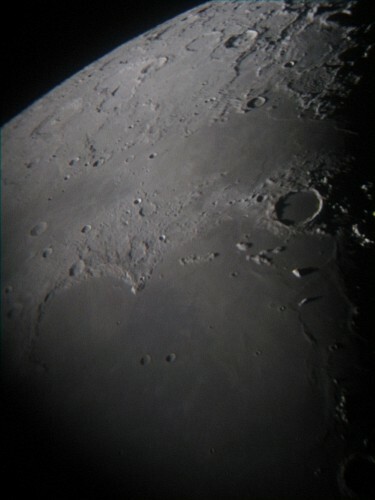 By mounting a camera to the telescope, you are increasing the camera’s focal length to that of the telescope’s. 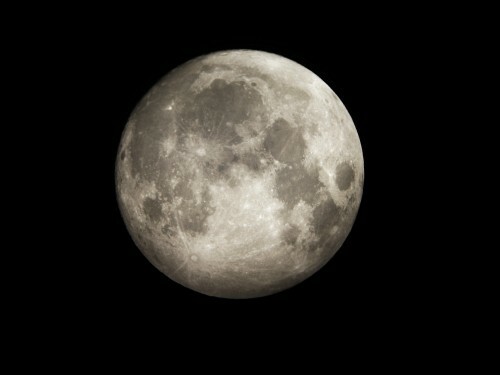 For example, this means that I am shooting the moon using a 1.2 meter (1200mm) lens. 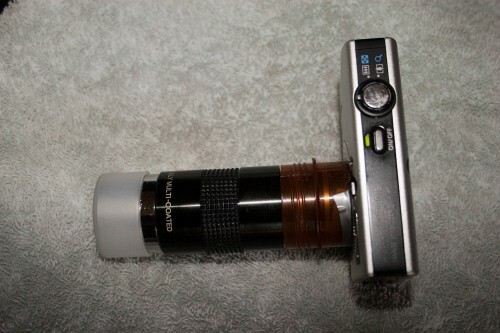 I have a camera projection mount for my dslr, which allows me to attach my camera and an eyepiece to the telescope. I have found that for best results, especially afocally, the dslr is not the best camera. I use a Canon IXUS80 IS (Powershot SD1100 IS) mounted directly to the telescope lens using an old pill bottle from the chemist. 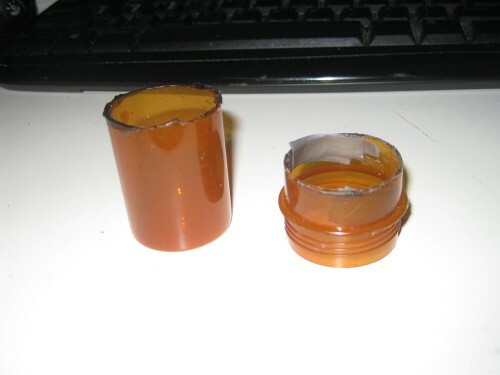 The pill bottle is sawn to a length that allows the camera to sit just above the lens surface. This is the second such hacked-together lens I have used and by far the most successful. The camera is very light yet sturdy (dropped it a few times). It’s easily supported by the mount on the telescope. There’s just enough room inside the mount for the camera to optically zoom (3x) and the little compact is quite fast (2.8). Previously I bolted the camera to the telescope mount so that the lens sat in the right place, but with the pill bottle mount, the camera is always in the right place. I can vary the zoom on my shots by using different lenses on the telescope, a 25mm lens (shown here) will get me all of the moon and some sky around it, while a 6mm lens will get very very close up. Each of these have their limitations and I find using a 15 or 25mm lens gets the best results for the “whole moon” closeups. Also here, focus is essential. I like the compact camera because I see what the CCD is seeing live, so I can get the lens focused, then mount the camera and refocus the telescope to get the sharpest focus possible. For a while I was getting a lot of out of focus shots, due to not accounting for the extra 3-4mm the mount adds to the whole rig, focusing the scope while the camera was mounted fixed this right up. Also I prefer the compact because of CHDK. 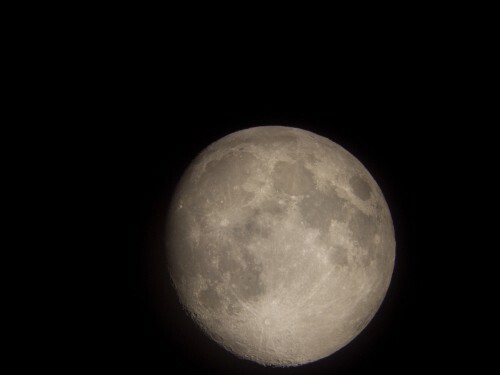 I have the hack installed and it gives me pinpoint control over most of the settings of the camera, as well as allowing me to shoot in RAW, this is possibly the best thing CHDK does for the moon shooting. So, once you have the moon shot you want, by whatever method, you’re about two thirds of the way to your finished shot. There are many ways to do post production, and many awesome and free bits of software to do it with, so instead of trying to list all of them, I’m going to talk about my process with moon shots. A note: It is always best to do the least post work as possible. This means that your shots should be the best you can possibly get them. First off, I try to get the noise out as much as I can while still keeping as many details as I can. I used Adobe’s Lightroom Noise Reduction until I discovered Topaz DeNoise. I also use Photoshop to remove some noise and enhance detail. If you have shot the base plate at 80-200 ISO, your noise will be a lot lessened. As it’s always better to plan ahead than try to fix it later, follow the temperature guidelines, look after your ISO and any noise reduction you do will be a lot easier. This is a process where your image is compared to a frame taken with the camera’s lens cap on or otherwise covered. This allows any noise that was present in the CCD to be removed from the image. Many cameras do this upon saving RAW frames, compared to a image in their memory. If you have taken several frames through the evening shoot there are many free and good quality programs that allow you to make your own dark frame subtraction. It make not make a lot of difference, but it will make some. I use BlackFrame NR for mine. 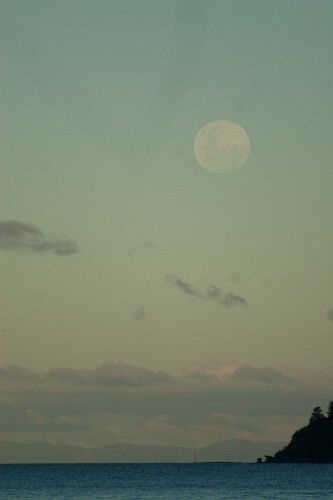 The moon is a 2 colour subject – the lighter highlands and the darker maria. These make up the face of the “man in the moon” and in your raw footage these don’t have as much contrast as what would be desired. A lot of the post work I do for moon shots is contrast and colour adjustments. The moon looks a lot better with higher contrast and sharper details. Depending on the shot I will crop to highlight the subject, usually the moon 🙂 Oh and of course, shooting through a telescope inverts the image, flip it vertically to get it back. Well, that’s it folks. 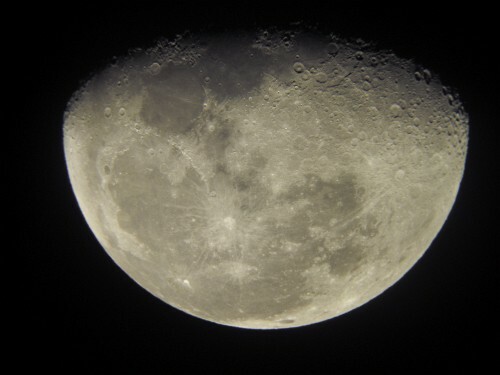 Hopefully this article gives you some hints and tips on how to get better shots of the moon. If you have any further questions and inquiries, please feel free to ask anything through the blog. Jason Brown is a New Zeland based photographer who experts on Zero budget Astrophotography. You can follow his blog here. One thing I did was create my own library of Moon shots, over the course of a lunar month. I used a Canon Powershot SX50 to get good, high-resolution photos with the equivalent of a 1,200 mm lens, and I can add the image to a photo I had taken before, matching the Moon phase to the date the photo was taken (I use the Photographer’s Ephemeris site to get that data). Nice tutorial. Reminds me of simply taking photos in my dad’s telescope’s eyepiece when I was younger. I’m still looking for an affordable way to take moon shots that fill my camera frame, to use for creating moon silhouettes, and scenes back lit by the moon, possibly with flashes. This is a crop from a 42mp image of the moon, taken at 600mm on a full frame camera. To fill the frame and get the highest image quality possible, I’d need something like a 2400mm equivalent lens. Do you guys have any idea about the most affordable options to get that kind of shot? Could a telescope that’s not too expensive (like, $500 or so) give me a sharp shot that covers a full-frame sensor without too many aberrations and the ability to have a distant scene in focus?